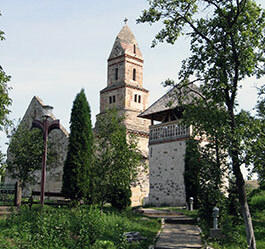 The church of Densus, a village in Tara Hategului (Hateg County), located few kilometers far from Ulpia Traiana Sarmisegetusa is still keeping its secrets so that no one can certainly say when it was built. Historians have different opinions. 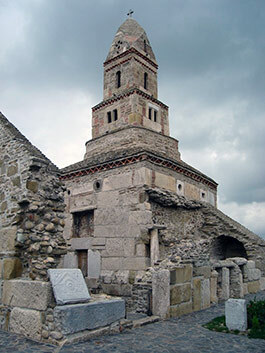 Some of them say that it was built on the ruins of a pre – Christian edifice in Dacia, others believe that it was built on the foundation of a temple dedicated to god Mars, many say that the church was initially a mausoleum dedicated to general Longinus Maximus that was killed by the Dacians, Nicolae Iorga places it in the 16th century, while art historian Vataseanu believes that it dates from the last quarter of the 13th century. 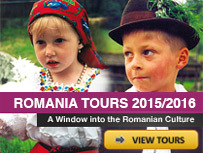 What is certain is this: at this point, it is the oldest church in Romania in which services are still officiated. 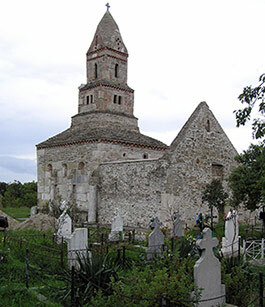 The church is 30 meters long, 8 meters wide, 18 meters high and it has an interior space of 15 square meters. The walls were built of bricks with Roman inscriptions, capitals, tombstones, sewerage pipes, blocks, marble, columns and sculptures taken from Ulpia Traiana. The pronaos, under the form of an “L”, is uncovered, and guarded by four thick pillars covered with tombstones. The altar table is also made of a tombstone whose letters were deleted. Above, there are two lions that stay back on back. The naos is pierced by a tower around which there is a narrow space covered by a prop vault, and at East there is a semicircular niche. The roof is made of stone plates. The mural paintings inside the church, on an ultramarine background, dates from the 15th century, and the painter who made it put a simple signature: Stefan. 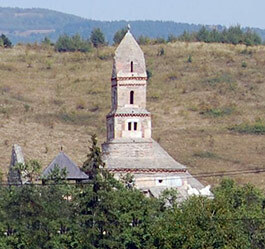 Baby Jesus, dressed in a Romanian popular outfit, and hold by Virgin Mary is represented on one of the pillars. Unfortunately, many paintings were destroyed by Reformists during Middle Ages. 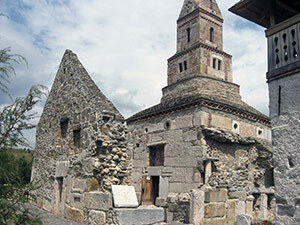 Specialists say that the church of Densus could be a copy of San Nicoara Church from Curtea de Arges, of which only some ruins are to be found nowadays. 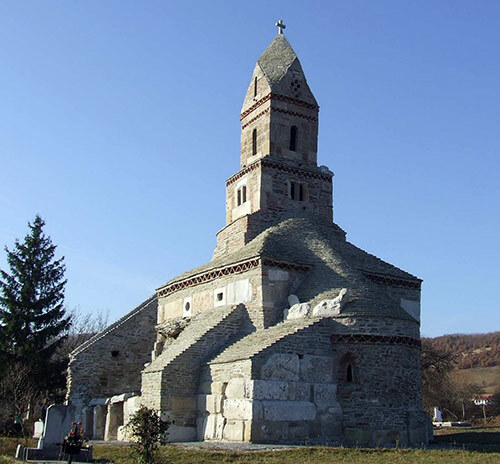 The coincidence is that it has the same dedication day as the church from Arges, namely Saint Nicholas’ day. 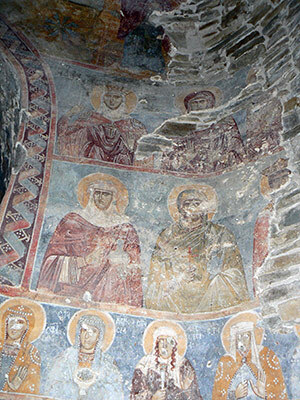 The mural paintings inside the church, on an ultramarine background, dates from the 15th century – Densus Church. A turning point in the history of this church is placed in the middle of the 19th century. At some point the inhabitants of the village wanted to put it down so that they can built a larger one. 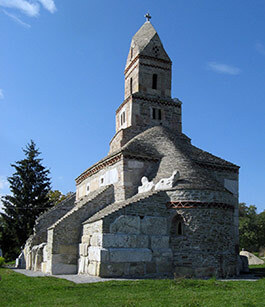 Finally it was saved by the authorities in Budapest, who considered it a monument and forbade its destruction. 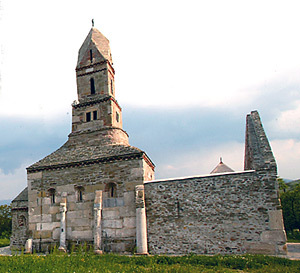 Before 1989, the image of the Church of Densus was on one of the most popular postal stamps, the one of 40 bani. Few years ago, with the help of the American ambassador in Bucharest, Michael Guest, the church received a 20 000 dollars donation from the United States of America, money that was used to renovate a great part of its mural paintings. 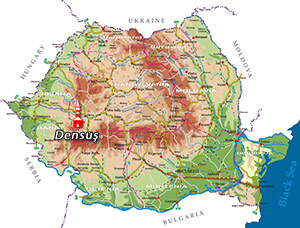 To reach the Church of Densus one must drive about 10 kilometers out of Hateg town, and in the centre of Totesti village he must take to the right. 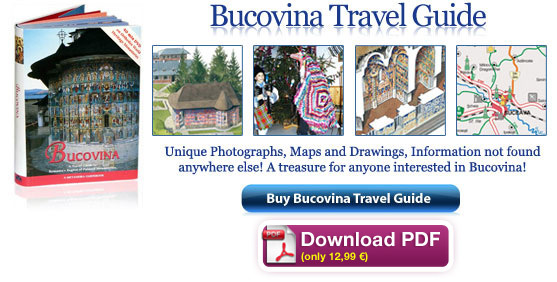 Accommodation units are only in Hateg or Sarmisegetusa. Above the altar, on the roof, are two lions that stay back on back. 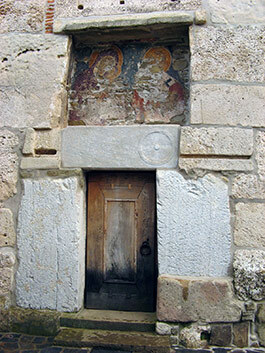 The entrance in Densus Church, Hunedoara County.